The visit to the Kinsley family that Evelina had made the day before lingered in her mind. She talked about it with both sisters-in-law, no doubt describing the family, the conversation, and the twelve pots of flowers she got to bring home. Was she bragging or sharing? Were Sarah Ames and Sarah Witherell interested or only tolerant? The Kinsleys were well-to-do, prominent citizens of Canton, so one suspects that both sisters-in-law had some curiosity about them. Yet it had only been a week since George Witherell had died, so Sarah Witherell may have had limited attention for Evelina’s gadding about. The pretty little flowers in Evelina’s garden must have brightened up the yard of a home whose occupants needed cheering up. Pinks are Carnations? That’s a new one for me. 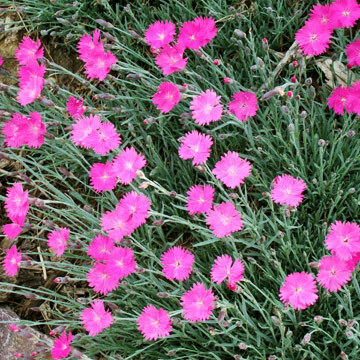 I can see they are the same family but thought Carnations had more rows of petals and pinks, just one row, plus always being “pink” whereas Carnations are famously mostly white or red, unless dyed. In 19th century reference material (at least the books I’ve seen), they are seen as the same flower. Confusing nomenclature, for sure.